The 2015 Hyundai Sonata Eco is the Korean maker's most fuel-efficient mid-size sedan that doesn't use a hybrid powertrain. And it highlights the two parallel paths that automakers are taking as they work to boost gas mileage ratings to meet steadily rising corporate average fuel economy rules. The Sonata Eco uses a smaller gasoline engine, a different transmission, and some other modifications to deliver the highest ratings of any non-hybrid Sonata. Unlike the conventional gasoline Sonata, with its 2.0-liter engine, the Sonata Eco is powered by a turbocharged 1.6-liter four that produces 178 horsepower and 195 lb-ft of torque. 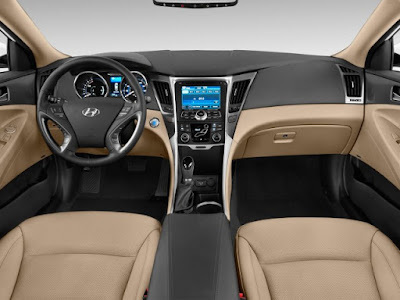 The Eco is also the sole Sonata to use Hyundai's own seven-speed dual-clutch transmission, rather than the more conventional six-speed automatic. It's also fitted with a high final-drive ratio. The 2015 Sonata Eco is EPA-rated at 32 mpg combined (28 mpg city, 38 mpg highway). That compares to the conceptually similar 2015 Ford Fusion 1.5 EcoBoost, which comes with ratings of 29 mpg combined (25 mpg city, 37 mpg highway), but uses a conventional six-sped automatic transmission. We had driven the Sonata Eco briefly last October, during testing for our Green Car Reports 2015 Best Car To Buy award nominees. But quick loops through the twisty Malibu canyons above Los Angeles are hardly representative of how most buyers will use a car like this. So, last December, we got a chance to test its real-world fuel economy on a long Northeastern road trip--although it had a higher proportion of highway miles than many Sonatas may see. Still, over 540 miles, the car's trip computer told us we had achieved a rating of 33.2 miles per gallon overall. That's about what we expected to get from this particular mid-size sedan with two occupants and their luggage (especially in cold winter weather that required constant use of the heater and fans). 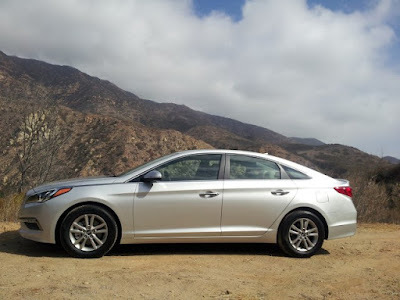 Overall, the 2015 Hyundai Sonata Eco has all the benefits and virtues of a big mid-size sedan.